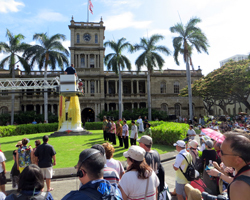 Celebrate King Kamehameha Day During Your Honolulu Hawaii Vacation. King Kamehameha Day: A Date With Destiny! (Kah-may-ha-may-ha). June 11 is Kamehameha Day in Hawaii – commemorating the date of the great king’s birth. Like all such legendary figures, King Kamehameha’s origins are steeped in folklore. I’ve heard various ancient Hawaiian myths that foretold of a great king who would unite the Hawaiian Islands. One such story says the sign of that king’s coming would be a comet. Thus, when Kamehameha’s birth in 1758 coincided with the passing of Haley’s Comet, it seemed as if his fate was written in the stars. 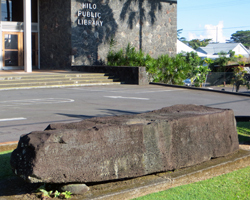 Meanwhile, another tale prophesied that the king who overturned the 7,000-pound (3,000+ kilograms) Naha Stone at the Temple Pinao in Hilo would basically be unstoppable – the greatest king in Hawaii history! In this literary epic, which rivals Arthur’s sword in the stone, Kamehameha proved he was that great king with one mighty demonstration of his right to rule! Regardless of what you believe about the king’s legendary rise to power, Kamehameha Day itself is a fairly big deal simply because Hawaii is the only U.S. state to have had its own reigning monarchy. Prior to Kamehameha, Hawaii’s main islands were ruled as separate kingdoms; and feuding between chiefs and kings was common. But with military prowess, diplomatic skill, and apparent manifest destiny, all that strife ended with the 1810 surrender of Kaumualii, the king of Kauai. King Kamehameha the Great succeeded in uniting the Hawaiian Islands as one kingdom for the very first time! Thus, it’s not surprising that in 1871 Kamehameha V chose to celebrate his grandfather’s birth with a kingdom-wide holiday. In those days, the occasion was observed with carnivals, fairs and races. The tradition continued even after the unjust overthrow of the Hawaiian monarchy. Then shortly after Hawaii was annexed by the United States of America in 1959, Kamehameha Day was among the first holidays proclaimed by the 50th state’s new government. Although the official holiday is always observed on June 11, holiday festivities and events are generally held on the weekend before that date (unless the holiday falls on a weekend, of course). That weekend of celebration begins at approximately 3:30pm on Friday afternoon at the King Kamehameha statue across King Street from the Iolani Palace in downtown Honolulu. The festivities generally begin with a performance by the Royal Hawaiian Band. 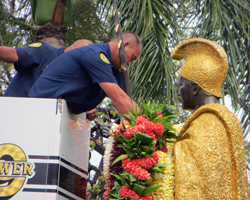 Then, Hawaii’s most famous statue is draped with scores of beautiful Hawaiian lei. 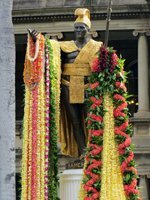 The King Kamehameha statue is a great Hawaii attraction in its own right; but when it’s covered head-to toe with hundreds of meters of floral garlands, it is truly a spectacle to behold! The lei draping generally draws a crowd of onlookers, but it’s really not that much of a show. It’s a rather slow and formal process as all the lei are presented by various groups; and then they are painstakingly raised and positioned by a crew of firefighters on a ladder truck. Don’t get me wrong… it’s not boring, but it’s not exciting either. You could just as easily use the time to tour all the nearby attractions – Iolani Palace, the Hawaii State Capitol, Kawaiahao Church, and the Hawaii State Art Museum – then return to the King Kamehameha statue to see it in all of its flower-emblazoned glory. Lei draping ceremonies are also held at the duplicate statue in the U.S. Capitol Visitor Center in Washington DC and at a similar statue on the Big Island of Hawaii. Although it can vary from year to year, there’s a good chance that the weekend observance of Kamehameha Day will coincide with the first night of Waikiki’s Pan Pacific Festival. That means your free Hawaii activities fun could be just getting started! 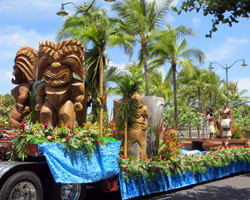 If these events do in fact, coincide during your visit, you could finish checking-out the Hawaii attractions around the King Kamehameha statue and then head down to Kalakaua Avenue for a block party hoolaulea! Want your own traditional Hawaiian lei, for any/every occasion. Order one online, and save yourself the hassle of running around looking for just the right style: Shop for Leis (link opens a new window/tab). 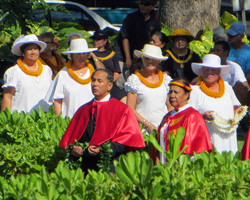 The next day, Saturday, begins with a Kamehameha Day parade from the Iolani Palace to Kapiolani Park (which also celebrates its establishment on June 11). This 8-kilometer parade route has to be the longest of which I’ve ever heard! Seriously. It takes almost two hours for the various participants to cover the entire distance from start to finish! The nice thing about such a long parade route, however, is that you really don’t have to fight any crowds to get a good view. There’s plenty of room to spread out along the route. Nevertheless, the most popular viewing locations tend to be next to recreational areas such as Restaurant Row, Ala Moana Beach Park and Waikiki Beach. I’m assuming that you’ve seen a parade before, so you probably already know there will be marching bands and decorative floats. That’s a given. What makes this parade unique, though, are the floral arrangements, a symbolic royal court, and the Pa’u (pah-ooh) riders. 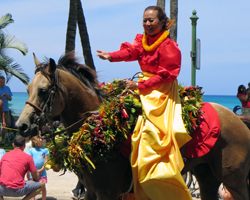 These riders – representing each of the main Hawaiian Islands – feature a princess (attired in elegant nineteenth century royal dresses and robes) and her color-coordinated mounted attendants. 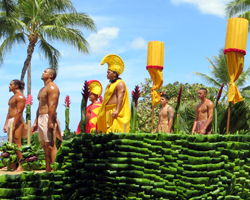 Add some fantastic floral lei, and this re-enactment of royal Hawaiian history is truly a spectacle like no other – a vivid showcase for the uniqueness of Hawaii. The Kamehameha Day parade generally starts at about 9am. If you’re planning to watch the parade near the end of the route in Waikiki, keep in mind that the participants have a lot of distance to cover. You won’t need worry about saving your seat along Kuhio Beach Park until probably 10:30am or even a little later. 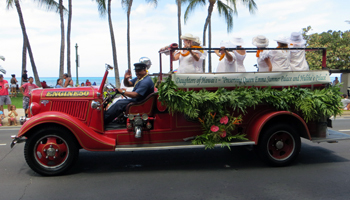 After the parade participants have cleared the area, Iolani Palace and the surrounding area then plays host to a holiday hoolaulea (block party) featuring cultural demonstrations, exhibitions, craft vendors, children’s activities, food booths, souvenirs, and free entertainment! Additionally, Iolani Palace usually offers free tours. And the Judiciary Museum at Aliiolani Hale (behind the King Kamehameha statue) has been known to do likewise. Unfortunately, I don’t have any pictures of the hoolaulea to post because I’ve always watched the Kamehameha Day parade from other locations and then gone to the beach or park afterward. What you choose to do is up to you. I’m giving you countless options.